John Cantor Heat Pumps: How energy-efficient should a heat pump be? How energy-efficient should a heat pump be? Heat pumps have always been cited as energy saving devices. The fact that they can give out a quantity of heat several times that of the motive power to drive them is proof enough. However, the sceptics have in the past rightly pointed to the inefficiencies of the source of that motive power – electricity, and many conclude that the inefficiency of the power stations coupled with the very high efficiency of a heat pump only just cancel each other out. i.e. why not simply burn the power station’s fuel directly in the home without the complexity of heat pumps? It is clear that the range of achievable efficiencies that a heat pump system delivers can vary greatly. This is primarily dictated by the type of application, and secondarily by the engineering details or the system. For designers to evaluate the net-worth of a potential system, a good grasp of the environmental issues are required. CO2 seems to be the prime consideration here, and we can make simple mathematical comparisons to see if the real advantage of a heat pump is sizeable or only marginal: worth installing or not. On the generation side of things, market forces and other factors drive the decisions that dictate how the National Grid buy and produce electricity. The UK's generation ‘mix’ leads to a figure of how many kg of CO2 are released for every kWh of electricity produced – on average, around ½ kg for each unit of electricity. To make things complicated, this varies over the day, over the seasons, and will vary year on year. (Note: I ignore here any ‘green’ tariffs on the grounds that we would need a great deal of it to make a notable difference to the figures nationally). Given the UK figure of 0.5kg/kWh, and a rough notion of expected future variations, we should be able to compare CO2 figures for direct electric heaters (100% conversion), with gas and oil heating. We should now be able to consider heat pumps with various COPs, and arrive at some figures for the efficiencies that we might like to achieve. The vertical (left-hand) axis shows pollution figures for direct electric heating, gas and oil. 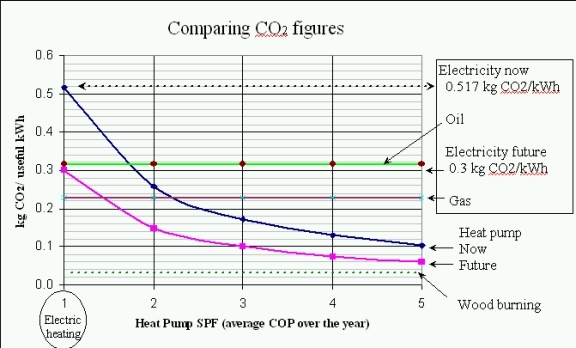 The graph shifts to the right with increased COP or SPF of a heat pump (COP1 is the same as an electric heater). As we can see, it’s relatively easy to work out a break-even SPFs compared to common heating methods. The more difficult question is ‘How much better should a heat pump be’? At this point it seems important to turn our attention to what efficiency levels heat pump technology can offer, then to seek the compromise that all such designs are based upon; cost / benefit. If very high COPs are attainable, but excessively costly to manufacture and install, they are probably of little benefit. At the other end of the spectrum; cheap low-efficiency systems may bring no carbon saving at all. We need to look for application that are practical and affordable to install, and show a good CO2 saving. The question to ask here is - is the particular application a good one for this technology? Is it one where a high COP can be achieved without excessive installation cost. If not, maybe a different technology should be adopted - eg. If a boiler can be installed for 1/3 the cost, the money saved may allow some very serious insulation. The outcome might give a better net energy saving. A holistic view is needed, and for heat pumps to compete- they need to be energy efficient. My perception of people’s expectations for SPFs (annual COP) is that they have had a knock over the last year or so. I had hoped that SPFs might pan-out around 4 - given some improvement in the technology over the years, however, it seems that many systems have in recent years, fallen short of what’s-possible. It seems to me that the industry is all too willing to go down the road of ‘mediocre’ efficiency. Indeed, for the heat pump industry to survive at all, installations must be affordable, so some are only too keen that, for example, an SPF of 3 is perceived as good – and who can blame them?. Taking this further, if systems can be made that are cheap and easy to install, then break-even SPFs (compared to gas) might become attractive. A heat pump could possibly become a ‘convenient heating method’ with no environmental advantage. So what efficiencies do we need? The game on the DECC website titled ‘2050’ is worth a look. It shows how difficult it will be to achieve our carbon abatement targets by the year 2050. If we are to get even near, we need as much COP/SPF as we can get! The recently produced Emitter Guide ( http://www.microgenerationcertification.org/admin/documents/MIS%203005%20Supplementary%20Information%202%20-%20Heat%20Emitter%20Guide%20v2.0.pdf) has been developed as a ‘guide’, not a design tool (‘Emitter’ referring to ‘heat emitters’ - radiators or underfloor). If I understand it correctly, the guide was produced to assist in ‘steering’ designers and installers towards better systems. It has a well laid-out flow chart for the installer/designer to consider both new and existing radiator, and should be commended highly for its recommendation to stand-back and consider implications of improvements to thermal insulation, or reducing ventilation losses. This is a welcome deviation from the old just-do-my-bit ways of the industry. However, as I scan down the expected SPF figures for the various options of radiator oversize or underfloor heating pipe-spacing, The question I am asking myself is – how does anyone know what SPF to aim for? I have considered this intangible question for many years, and I am still much in the dark. The general drop in COP expectation is not helped in my view by the range of SPFs quoted on the emitter guide which, for the air source system, has a mid-range of 2.85, and the lowest figure (2.1) relates to CO2 figures worse than gas. If one were totally in the dark, one would probably be ‘swayed’ to thinking that an SPF of 3 was quite reasonable. It is also important to note that the figures relate to space-heating only and since the vast majority of installations also heat hot water, and since DHW heating can occur with a relatively low COP in the region of 2 to 2.5, it is clear that some of the figures quoted will be pulled-down by DHW heating in practice. With this in mind, the 6 star option (flow temperature only 35°C) could be viewed as ‘normal’ as opposed to the ‘exceptionally good’ that it might currently appear, being top of the list. I wonder at this point if those with a good handle on the environmental issues should get together with those who know what real-live SPFs are practically achievable, and give some guidance on what systems are worth pursuing, and which ones are not. System designers need to know want level of system efficiency to aim for, otherwise there is a danger that other figures will be found, e.g. minimum standards, and these will be used as those targets. I have added this intesting graph sent to me by John Logan of Maine USA (East Coast). Its interesting to see their experience. John is a pioneer and proponent of the 'Standing Column' borehole system, and their experience looks impressive. They are experiencing average COPs of 4.5. This shows an application and a climate that match well - here we have very competitive running costs and very good SPF. The graph also shows a 12RLS2 air-air split systems with COP almost 3 - obviously fits well in their climate. Nice graph John. I agree that the new emitter guide is a good piece of work. The EU is attempting to answer the question in the Renewable Energy directive. There's an equation that calculates the minimum acceptable SPF based on average power plant efficiency. At the moment this comes out about 2.9 which is the number that was picked up by DECC for RHI purposes. There's not really any agreed methodology for measuring this however. We need a new standard perhaps? I admit that I probably have an unrealistically high expectation- its simply too expensive (installation) to achieve the high SPFs that I would like to see. SPF 2.9 is significantly better than gas, and probably realistic for the masses. That said, we should pursue the 'low hanging fruit', i.e. applications that give the best COP for minimum install cost. John Logan of Maine USA (East Coast)had asked me to put his graph (see above). Its interesting to see their experience, and it seems that he has achieved what I am alluding to; Good COPs (4.5) with an affordable installation. John is a pioneer and proponent of the 'Standing Column' borehole system, and their experience looks impressive. Over to you John. Thanks for sharing your blog, which I found very interesting. Here in Maine, where 80% of the residences heat by oil, the big issue is cutting heating costs. There is very little concern about CO2 with heat pumps, particularly since our Maine electricity is relatively clean - approx 1/3 hydro, 1/3 nuclear and 1/3 natural gas. Hence the focus on the highest possible COP for lowest operating cost - which is achieved from geothermal heat pumps. There had been some movement to use mini-split heat pumps for retrofit situations in smaller homes, and claims were being made that these air sourced heat pumps are quite efficient. I was asked to analyze the actual performance of one of the best currently available - the Fujitsu RLS2 mini-split series. I did this for two locations in Maine - Portland and Bangor. The highest performer in the series is the 12RLS2, and using the heating season temperature bin data for both locations, I came up with the plots in the attached files. You will note that the Portland results, where there are less annual degree days, showed an effective annual COP of only 2.97, and the Bangor data, with more degree days computed out to 2.88. Meanwhile, it is easy to achieve a COP of 4.5 for our geothermal heat pumps on standing column wells - where the lowest entry water temperature can be expected to be around 45 F (=> 7.2 C). Another point I make to customers in Maine has to do with the affordability of geothermal heat pumps, particularly for new construction residences, when the installation is financed. In fact, such installations are typically "cash flow positive from day one", any time oil is above $1.50 per gallon or propane is above $1.00 per gallon. Currently both oil and propane are around $3.50 per gallon, so the annual heating cost savings from financed geothermal heat pump installations is huge. (b) The oil or propane cost per gallon thresholds, above which the geothermal system is "Cash Flow Positive From Day One".for systems which are financed. (c) The Return On Investment (ROI) compared to fossil, for geothermal system installations which are paid for as a lump sum up front. (d) The payback period in years, for systems which are paid for up front. It is interesting to note how extremely short these intervals are - now that oil and propane are both over $3.00 per gallon. The plot at the bottom of slide #4 shows the range of cost per gallon threshold for both oil and propane for the 8 systems having an oil alternative, and the 3 systems otherwise considering propane. This approach has been very effective in explaining to potential homeowners how to regard geothermal systems as an investment rather than a cost.